Andaz is a Hindi word meaning “personal style.” Tattooed and uniquely formed. Every Andaz resort is special and personalized to the neighborhood in which it resides. The very moment I arrived at Andaz's property, I was especially impressed by the local art and architecture of the bungalows. My boyfriend, Reyce, and I were immediately greeted upon arrival with the warmest of welcomes. Donald, our receptionist that so boldly took care of us, checked us in and gave us a tour of the surrounding area. He gave us free wine, cookies, and told us about the nearby artist residency "Cattle Track Arts Compound" that often collaborate with Andaz Scottsdale. The night grew dusty, forming clouds of orange sand against the vibrant swaying palm trees. The air smelled of musty mesquite and creosote. My entire body felt as relaxed as can be after my 60-minute full body massage by one of Arizona's most renowned massage therapist. Truth be told, Reyce and I felt like kings and queens. We didn't wanted to leave! My mouth is still watering from our dinner. I enjoyed a glass of diamondback fizz sweetened with agave nectar and chowed down on a juicy red river trout. I couldn't leave without snapping pictures of the House chef up front -- too good. Our waiters kept bringing forth mini tapas before our main meal; brussel sprouts, watermelon, and local Medjool dates topped with fresh cream and pistachio crumbs. Like, are you kidding?! What a dream. Did I mention that 30% of the (ANDAZ)RED Cabana rental fee goes directly towards (RED) for HIV/AIDS research? Andaz allows their guests to not just experience the world from a new perspective, but also make a difference for those in need. (ANDAZ)RED Cabanas are the newest experiences offered as part of Hyatt’s World of Hyatt platform, which is built on the idea that a little understanding goes a long way. 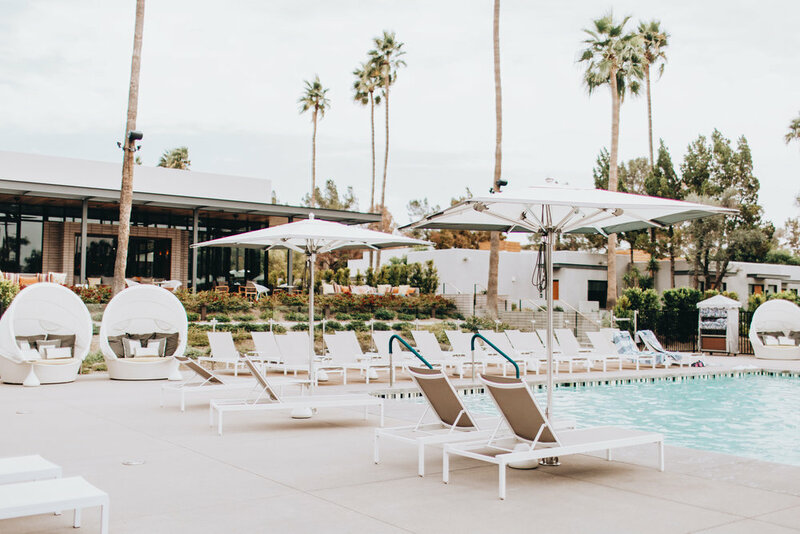 The Andaz brand’s collaboration with (RED) creates a unique opportunity for guests to have inspiring experiences at new (ANDAZ)RED Cabanas – while helping to save lives with every reservation. So beyond grateful to have been a small part of this growing community in the desert. Andaz provides a truly special experiences for those looking to escape in the wild West. Thankful for everything, you guys! Pictures of my beautiful friend, Shelby, in Dad's ole truck on a warm November afternoon in the desert. My trusty steed, River, hopped in the truck for a quick snuggle, but we let him stay in the frames anyways. Pretty cute, huh? Let's Talk: GET TO KNOW ME! -If I had to choose between movies or music, I’d choose movies. -I failed my driver’s test twice. -By the end of 2017, I would have been to 15 different countries and 22 U.S states. -Leonardo DiCaprio is my long-time favorite actor. I have seen every single movie of his AND read every single book that his movies were adapted from. The Revenant being my favorite, I think. Pretentious assholes or people who take themselves WAY too seriously. Like, lighten up and shut up. 3.) If you were an animal, what would you be and why? A wolf. By far my favorite animal. She’s an independently, irrevocably strong, uniquely beautiful, and wild being. Everything I aim to be. If you have the opportunity, I suggest you read “Women Running With The Wolves” by Dr. Pinkola Estes; a tribute of it is in my Instagram bio for god’s sake. Glass Castle or Wild. Both almost hit too close to home. Hot water (or steam!) with epson salt, Glossier Galaxy Face Mask, Burt’s Bee’s Face Moisturizer, a spritz of rose water, and sunscreen. ALWAYS PUT SUNSCREEN ON YOUR FACE! Organized as hell, clean, would take a bullet for my friends, and ambitious. I’ve also got a madly strong gut which makes traveling to different countries a breeze! I’m your typical textbook Cancer — overly emotional and sensitive to anything and everything. 7.) What is your love language? Early mornings blessed with coffee and buttery waffles. Full-time photographer or photo journalist. Part-time homesteader with goats and chickens and horses. Part-time yoga teacher. Maybe become a professor? And although I’m virtually doing two out of these four goals, I’m never going to stop learning. I must always be pushing forward and find new ways to stay adaptive. 9.) Best Meal You’ve Ever Had? After finishing our 5 mile trek through the misty Indian Himalayas to reach our first campsite, we plopped down under the tarp for lunch. Our personal chefs on the trip (yeah, amazing) were Nepali sherpas who graciously cooked ever single on of our meals. That afternoon, however, blessed us hikers with a plate full of spicy vegetable balls and chow mien. Handmade!!! My mouth is savoring just thinking about it and my heart is hurting at the thought of never having a meal as delicious as that one again. 10.) Last Thing You Googled? My Goodreads account to update my current reading list. Lol. 11.) What would be your Element: Water, Fire, Earth, or Air? For the longest time, I had always thought I was Water. But after taking a few online quizzes and truly studying my nature — I’m definitely Fire. I value the passionate, the exciting, and the intense. I love the juice of life—the experience of it—more than you value accomplishments or possessions. Plus, I’ve got a mean temper and live in the desert… so, it’s fitting. 13.) What am I Most Grateful For Right Now? All of the relationships I have with my family, friends, and boyfriend. I’m thoroughly convinced that I have the best people in my life. It’s a bit overwhelming actually. 14.) What am I afraid of? Not reaching my goals… and infertility. Amelie, Wild, A Clockwork Orange, Donnie Darko, Call me By Your Name, and Moonrise Kingdom. Spring or Autumn. I love pumpkins and red leaves just as much as fresh lavender and chicken eggs, man. Christy Dawn and Outdoor Voices. Coffee and peach oatmeal. A morning favorite! Maggie Bertrandt and Valerie Foien. Say their names. They are my #1’s forever and always. If you’re reading this, girls — LOVE YOU! 24.) What am I most ashamed of? 25.) Given the choice of anyone in the world, who would you invite to dinner?